Everyday objects have a new purpose as the Internet of Things (IoT), a development of internet connectivity in which everyday objects have network capabilities, allowing them to send and receive datais transforming the way we live, work and interact with our environments and now, they interact back, and lighting is no exception. The IoT is reshaping the lighting industry with smart and wearable devices designed for human interaction, ushering in a new era for the lighting industry and its consumers. Light-based technologies and services have been made available to users through fragmented design, presented in intimidating and unfamiliar interfaces – until now. In a new generation of connectivity, lighting can support features and communicate beyond turning on and off. These contemporary services give lighting designers, architects, end-users, occupiers and facilities managers the tools to create their own Internet of Things. The IoT creates a personalised ecosystem, enabling custom lighting opportunities that can improve wellbeing while connecting applications that were once fragmented. 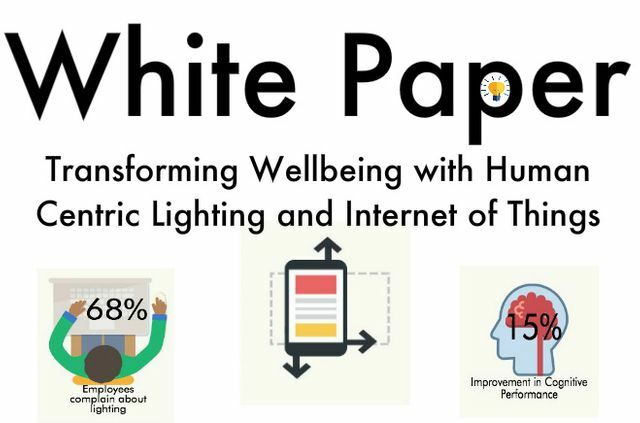 This white paper explores the connections between the evolution of lighting with its relationship to the IoT, and the importance for more widespread adoption of Human Centric Lighting in education, workplace, hotels and healthcare environments. With the invention of electric light came radical change, ushering humans indoors for longer periods of time. A life once dominated by the sun, now worships artificial light. Daily life adopted a new freedom indoors, and a new set of problems to go with. The sun defines our natural circadian rhythm, waking us up and lulling us to sleep at reasonable times. In a 1981 study, Dr. Charles Czeisler of Harvard Medical School demonstrated that daylight maintains a person’s internal clock, aligning us with the environment (1). He found that indoor artificial lighting can suppress melatonin production, inducing adverse consequences: reducing quality of sleep, contributing to obesity, diabetes, depression, SAD, anxiety, cancer and other diseases such as Alzheimer’s (2)(3)(4)(5). Most of us spend 90% of our time indoors with artificial lighting (6), increasing our chances of these dangerous side effects. We now know it’s non-optimal for us, not just physically, but mentally as well. A study by the American Society of Interior Design found that 68% of employees complain about the lighting situations in their offices, with it affecting their productivity and concentration. Humans need a balance of both darkness and light. However, lighting, as we know it will not provide the right balance. The “colour” of sunlight changes as it shines through different points in the atmosphere. As the sun rises, light levels increase and shift towards cooler temperatures. While the setting sun creates lower light levels and a warmer glow. These natural changes in “colour” tell our brain when to wake up and when to go to sleep (7). Throughout the day, daylight signals our brain to release appropriate amounts of dopamine and serotonin, creating sensations of pleasure, alertness, coordination, and impulse control. Cortisol flows throughout the day enabling stress responses, and decreases in the evening, relaxing us. As the sun sets, melatonin increases, creating additional relaxation and preparing us for sleep (7). According to an international light and wellness study (12), workers in windowless environments reported higher physical problems, lower vitality, and poorer sleep quality. Sleep quality plays a huge role in well-being and cognition. Reduced sleep quality can cause short-term impairments including memory loss, slower psychomotor reflexes, and diminished attention. Meanwhile, workers with windows, and therefore sunlight, had more physical activity, better sleep patterns, and a higher general quality of life (12). A study by the California Energy Commission also examined the power of sunlight in the workplace. Better access to natural lighting through windows consistently predicted better performance by 83% and slept an average of 46 minutes more per night (13). By placing people at the heart of design and working to the Well Building standard, we have the ability to add meaningful value by generating savings and enhancing health and wellbeing. Overall, the evidence is unequivocal; 92% of people who work in a Well Certified environment said the space created had a positive effect (14). As we spend more time indoors, we rob ourselves of the natural light cycle. The power of natural sunlight is undeniable, yet it is a luxury that few can afford. When we use Human Centric Lighting combined with the power of the IoT to create light changes that mimic the sun, providing us with those same benefits. When lighting can be altered for preference and benefit, it can be tied into and controlled by the IoT, creating a customised environment. It is predicted that both business and government entities will take on the IoT en masse to improve quality of life for its occupants (9). 3) Expanding to new markets or developing new product offerings. If policy makers and businesses get it right, linking the physical and digital worlds could generate $9.4/$11.1 trillion a year in economic value by 2025 (8). Healthier smart lighting helps conserve energy and reduce costs while influencing wellbeing. Human Centric Lighting (HCL) serves both the conscious and subconscious mind, catering to both internal needs and aesthetic desires: influencing mood, behaviour, sleep patterns, and general well-being, producing positive results as both workers and citizens. Implementing Human Centric Lighting as part of the IoT can change how we live and work. It can be applied to any indoor environment beyond the home and office, including education, retail, healthcare, and travel and hospitality. HCL and the IoT are changing our approach to architecture. The invention of electric light took us away from windows and natural light, now HCL and IoT seek to bring it back. At Cisco’s state of the art open Berlin Innovation Centre; HCL+IoT proves the benefits it can have on its occupants. “You don't see any light switches here,” said Bernd Heinrichs, managing director of Internet of Everything (IoE) Sales for the EMEAR and for open Berlin Innovation Centre. “Everything is automated. Heating, air conditioning, the lights, et cetera...All of it's done by a huge amount of sensors.” (14) This approach keeps workers engaged, focused, and at peace with their surroundings. But non-tech giants can apply it and reap the benefits as well. According to a study by the University of Mississippi, when students were exposed to lighting with higher light intensity and light temperature levels, like the ones featured in Focus, their performance increased by 33% compared to students without. Students also experienced a 15% improvement in cognitive performance, and a 10% decrease in healthcare and education costs for students with ADHD (7). Teachers have the ability to set the mood in their classrooms and give students the mental boost they need to succeed. Lighting also contributes to the customer experience. Average lighting alone creates shadow and contrast in retail environments, allowing you to highlight certain items and keep employees alert and safe at work, giving them energy during long shifts. Human Centric automated Lighting can aid us during our most vulnerable times. Time spent in hospitals or institutional care can keep patients away from natural lighting for extended periods of time. Yet, healing requires quality sleep. HCL, and more specifically, our TWL, can comfort and help patients maintain regular sleeping patterns, while helping to keep medical professionals alert during long shifts. Both airports and hotels have the opportunity to create a relaxing setting in the midst of stressful travel. Adjustable lighting can not only help travellers find comfort in unfamiliar places, but also help them adjust to time changes. These benefits are useless unless lighting can be adjusted easily. The IoT allows HCL in these arenas to be a possibility, allowing users to access these benefits without conflict. The question is no longer why use HCL+IoT options, but why risk living without it. Light that mimics the sun and automates to our environment can have overwhelming benefits, while dated lighting is detrimental to health and well-being. Shoppers, patients, students, and travellers can all benefit from the right lighting, accessed with ease through the IoT. HCL+IoT goes beyond producing light, translating into tangible health benefits and reduced costs. Working on HCL, Wellbeing and IOT projects, why not contact us for help.